Here’s the full video of Ariana Grande’s “One Love Manchester” benefit concert held at the Old Trafford, Greater Manchester on Sunday, June 4, 2017. Hosted by Sara Cox and Ore Oduba, the special concert was attended by 50,000 people. Performers line up include Justin Bieber, The Black Eyed Peas, Coldplay, Miley Cyrus, Marcus Mumford, Niall Horan, Little Mix, Katy Perry, Take That, Imogen Heap, Pharrell Williams, Robbie Williams, and Liam Gallagher. 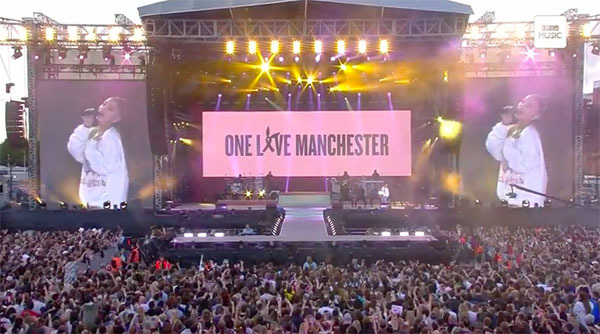 One Love Manchester aims to raise special fund to help victims of the Manchester May 22 blast that killed 22 people and wounded others. One Love Manchester” benefit concert was broadcast and streamed live on BBC One, BBC Radio and Capital FM networks.